UK paper reveals that funds from UK, EU used to pay thousands of terrorists, including murderers of the Fogel family and Hamas bomb-makers. Every year, the UK funds the Palestinian Authority to the tune of more than $100 million, including direct cash transfers. According to a new report, much of it goes to supporting terrorists guilty of the worst atrocities. Despite denials by the UK’s Department For International Development (DFID), an investigation by the Daily Mail has revealed that much of the $100 million given to the PA has been used for purposes other than humanitarian aid, including the construction of lavish mansions and funding for terrorists guilty of murdering Israelis. On Saturday the paper revealed that until last year, the UK had been funding the Palestine Liberation Organization directly, supplying the terrorist group with money it passes on to terrorists and their families. 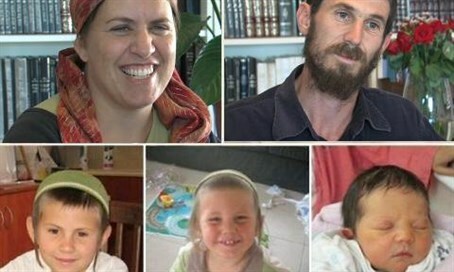 Among the recipients of these funds are Amjad and Hakim Awad, the terrorist murderers who broke into the Fogel family home in Itamar, slaughtering the parents and three children. The terrorist cousins received $23,000 thus far. Abdallah Barghouti, a senior Hamas commander and bomb-maker, known as “the engineer”, is another beneficiary of the terrorist fund, receiving an estimated $150,000. Barghouti is responsible for a series of deadly suicide bombings, including the bombing of Hebrew University in 2002. While the UK and EU now transfer funds through the Palestinian Authority, rather than directly to the PLO, there is often little practical difference, as the PLO runs the PA. Cash payments made to the PA are easily passed on to the PLO, and with Hamas a member of the PA unity government, it receives a significant portion of PA funds. All of this comes despite the fact that the UK's national deficit forced the government to borrow £70 billion (nearly $99 billion) in 2015. The UK spends more on foreign aid than any other developed country, thanks to a permanent commitment to spend 0.7% of its national wealth on aid - a commitment which forces agencies to spend the money in order to meet the directives regardless of the merit of the projects they spend on. A petition calling on the British government to curb its enormous, often wasteful expenditure on foreign aid has already gained more than 20,000 signatures since the revelations came to light. he Daily Mail has also found that despite officially handing responsibility for money transfers for convicted terrorists and their families to the PLO, the Palestinian Authority continues to directly fund those involved in terrorism. The family of two men arrested for terror attacks on Israelis reportedly receives monthly payments from both the PA and PLO. According to Itamar Marcus, Director of the Palestinian Media Watch organization, the EU and UK had chosen to turn a blind eye to the systematic misuse of funds they give the Palestinian Authority every year. Nasser went on to claim that should the Palestinian Authority win statehood, it would demand even more money from the UK. “You should pay us more money,” he said.